I'm really glad I gave the August Cake Slice challenge a try. The recipe for the Pistachio Petit Four cake from Sky High Irresistible Triple-Layer Cakes by Alisa Huntsman and Peter Wynne was a bit intimidating since it called for marzipan and ganache. If I have not said it before I really love this cookbook. The flavor combinations are interesting and the instructions are clear and easy to follow. The Cake is a simple butter cake that has roasted pistachios added for a slight crunch and nutty flavor. Each cake layer is then glazed with apricot jam, covered with a disc of marzipan, and topped with dark chocolate ganache. Once assembled the whole cake is drenched in the remaining ganache. I was not sure I would like the taste of this cake because of the apricot jam but, it is rally tastey. Especially the combination of the marzipans delicate almond flavor and the dark chocolate! This is a very sophisticated cake! I was able to simplify this cake by purchasing pre-made marzipan. I scaled the recipe down to make a 6 inch 3 layer cake so I had some marzipan left over after cutting disks for each layer. I Decided to try Marzipan roses. I tinted the marzipan with some pink gel food coloring and kneaded it until the color was uniform. A little coloring gel goes a long way! 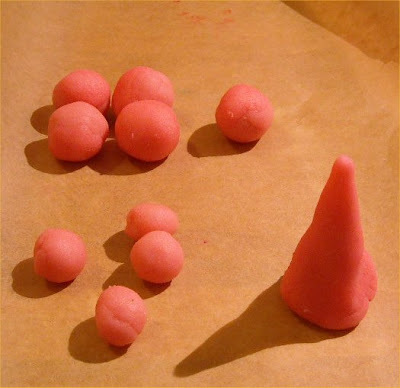 To make the roses you start with a cone shaped base of marzipan. Roll out for small sized balls and 5 larger balls. Flatten the balls 1/4 inch to make your flower petals. If it gets too sticky use a little corn starch. 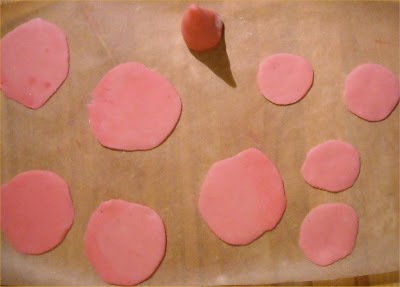 Press one edge of each flattened disk for the edge of the petals. The thinner you can get your petals the more realistic they will look. Wrap the small petals around your base cone allowing each one to overlap. Next attach the larger petals. Once you have all nine petals on squeeze off the base and you have a Rose! Great job on your cake and the marzipan roses look amazing. I agree that this cake is absolutely fab! Gorgeous cake! 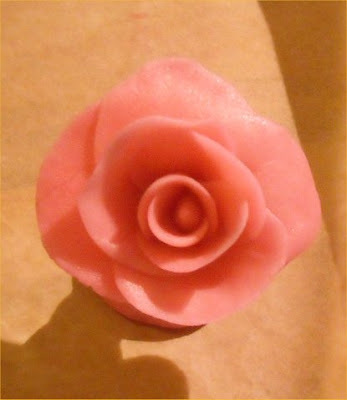 Nice pics on making the marzipan roses, too bad I didn't get a chance to make 'em. I'm glad you took on the challenge this month, can't wait to see your creation next month. I'm glad you enjoyed it. It looks fabulous! lovely roses!! i agree, pre-made marzipan is the way to go! Your roses turned out so life like. I didn't add very much color to mine but they were much darker than I wanted. How beautiful those roses! Your cake looks so yummy!